An update hit the Hangouts Dialer app this morning, bringing a much-needed and highly requested feature for the application – the ability to recognize itself as a standalone dialer app. Previously, when you would hit a phone number link on your phone with the Hangouts Dialer app installed, you would be directed to your stock dialer application. Now, with the update, you are given a choice to use either the Hangouts Dialer or stock dialer. From this point, you can choose Hangouts Dialer as your default call placing app, which is a big step forward and a feature we have been needing since day 1 of launch. The updated Dialer is now available on Google Play. 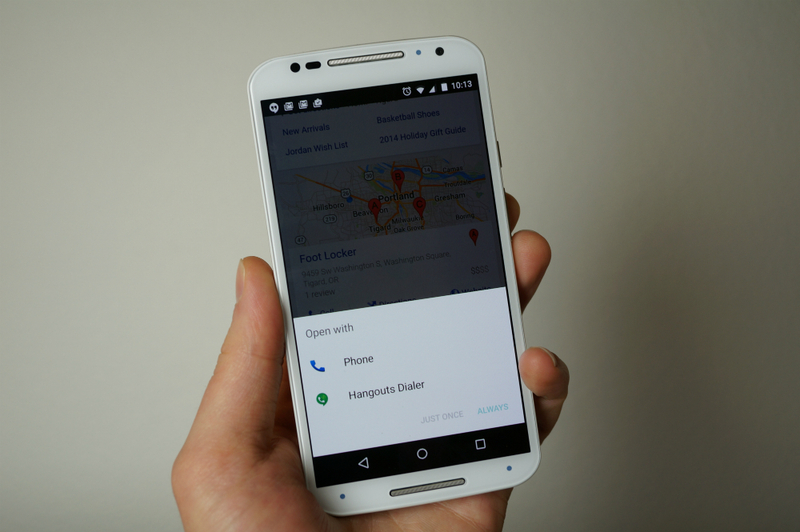 Now use Hangouts Dialer to place calls initiated from other apps that show phone numbers, like Search and Maps. Add to contacts from call history.